Having the ideas, to make a program that works, is the supreme thing ever made. The man considered as most powerful ever throughout the history of the political power is Stalin but the question is that what he considered as the most powerful thing ever. Whom he respected and why? He respected Lenin utmost but the main question is that what Stalin actually respected about Lenin? There may be many more questions leading to same objective answer. Like what Stalin valued most? What Stalin did actually fear? What Stalin wanted his sons to master at? What Stalin actually disallowed his enemies to have? All these querries could get satisfied in a single sentence. Having the ideas to make a program that works. We do have that. We are indeed equipped with that most powerful thing on planet earth that can drive the most of unprecedented manpower. People’s personal outlets possess that power. 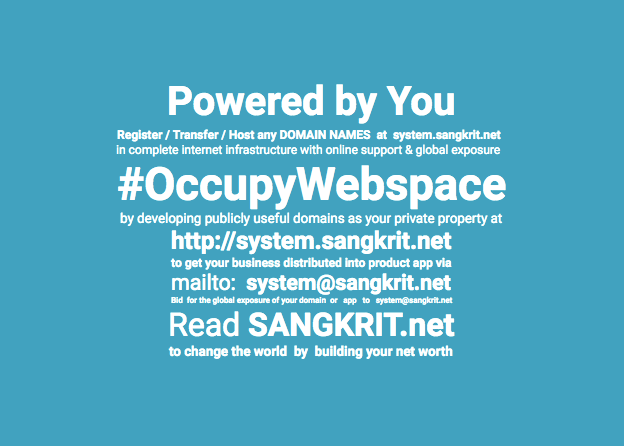 Sangkrit is such a program leading the greatest ever movement #OccupyWebspace as more than three billion people have registered their domain names to own the internet age by now. Unlike animals humankind make private property. Registering and developing a domain is the latest of its kind. Everybody could and should get involved into this by signing up for free SANGKRIT.net account making this the movement of everyone for everyone. Upgrading humankind into smartphone stage of internet age is the universal task. Stalin is relevant for recognizing the worth of data mining for extracting efficient intelligence. Richard Stallman keeps away from smartphone, calling it the portable tracking device and blaming it as Stalin’s dream come true. Julian Assange called entire internet age as what Stalin would have admired. So Stalin is at the receiving end of all the blame of internet age and its smartphone stage. But what for and why? In Stalin’s regime any uncomfortable facts were not just wiped out from photographs but from the planet earth and edited out of history as well. Yes there was Stalin before the Photoshop who did more than that but that is not all indeed keeping him still relevant through all the progress of internet age of humanity that is even making the most of politics also irrelevant. Stalin is relevant for recognizing the worth of data mining for extracting efficient intelligence. That is why he is getting increasingly relevant through the smartphone stage of internet age for data retention. Data retention is the Stalinist feature of smartphone stage of internet age. Machine learning is further implementing this. Whenever data is worldly unavailable, it is supplied by humane imagination. Stalin helped people invent a whole world by inventing almost everything. He invented his name, nationality, state, religion, god and public mindset as well for inventing the world’s greatest-ever empire as Soviet Union. So much imagination might have led anyone else into a mental asylum but Stalin, because of his unparalleled efforts in consistency with reality, emerged as the greatest-ever statesman. Humankind are curious animals. Fact or fiction, they just want to know anything. Whenever data is worldly unavailable, it is supplied by humane imagination. They simply fill the blanks by inventing information. That is the way, humanity is used to work. Therefore don’t ever hesitate in helping people with facts to improve their fiction. Signup for your free SANGKRIT.net account to become a personal outlet of its globally distributed order for doing that wherever you are so that now humankind get worldwide upgraded into its internet age. Business is the best behavior yet known and internet industry paves the best way of doing that. Ignorant people are mostly afraid of making decisions. They will come to know when you will let them know.